I was the fortunate recipient of private drum lessons beginning at age 13. I had no idea such a thing as private drum lessons existed until my father surprised me during a visit to the music store. What a great surprise it was. Receiving drum lessons was one of the best experiences of my life. By the time I joined the high school band, I was the most advanced drummer in my class, even compared to drummers who had already been in school band since the beginning. I continued to study drums through college, receiving a bachelor of music degree, and continue working as a semi-professional musician to this day. The enjoyment and experiences I have had as a musician would not have happened had my parents not arranged for me to take private lessons. I probably would not have known that private drum lessons existed until years later, when my formative years had passed. As an adult, I can see wishing I had known about private drum lessons if I hadn’t received drum lessons when I did, but thinking it was too late, or too time-consuming to try learning drums now. Learning a musical instrument as a youth is more achievable than it is as an adult. One of the main challenges for adult drum students is simply finding the time to practice. Adults know this challenge applies to other aspects of their life. Time is at a premium. So there is an advantage to learning an instrument as a youth, whether or not the cognitive ability of children to learn a musical instrument is better suited to the task. And part of the benefit a child has when receiving private lessons is a parent reminding them to practice, which is not unrelated to the parent’s tendency to pay for the lessons, but which is also motivated by parents’ desire to see their child develop and do well. When a student comes to a drum lesson unprepared, it requires us to spend lesson time practicing. This is not a good use of lesson time. Students are expected to practice daily. Twenty minutes of practice every day is recommended. Time spent practicing for fun or other materials, such as band, should be in addition to the 20 minutes spent on the drum lesson assignment. Without 20 minutes of daily practice, the long-term progress of the student is considerably impaired. As a result, even a capable student may become discouraged from their once-exciting interest in being a drummer. Students who spend more than 20 minutes daily can make faster progress. Progress is primarily dependent on the student. It is accomplished through practicing every day. A drum teacher’s job is to determine what a drum student should practice; the student’s job is to put in sufficient and consistent time practicing. I encourage practicing things other than the drum lesson assignment. 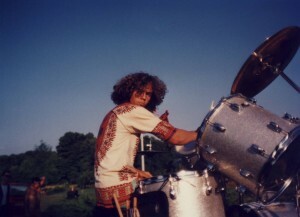 Some of the best musical development I made as a young drummer was while creating my own beats and playing in bands. That kind of personal exploration deepens a drummer’s understanding of and connection with the drums. Please come prepared. Lesson time is not practice time. I was a shy child and still consider myself introverted as an adult. Because of this personality characteristic, I often found it scary to ask teachers or adults when I didn’t understand something, for fear of sounding foolish or being “put on the spot.” I understand these feelings in children and adolescents, and try to be sensitive to those feelings in my students. For this reason, I encourage my students – and parents of these quieter students – to call or send an email with drum lesson questions. Some people are natural performers. I am not. I am always nervous prior to and often during performances. Some people are natural performers and love to perform, wether they are well-prepared or not. For the rest of us, the solution to being nervous during a performance is to be well-prepared – that means one thing: practice adequately. When the performance begins, the nervousness subsides and the well-prepared musician is able to play drums correctly because they have already done it so many times while practicing. Students are expected to maintain regular attendance, and to inform me when schedule conflicts arise. There is no contract. but as long as you are on the drum lesson schedule, you are required to pay for the lesson time that is reserved for you. Please read the Studio Policy for details about payment and attendance. Always use appropriate ear protection. See How To Protect Your Hearing for information. Ask me if you need advice. Being a good drummer is not easy. It takes effort, patience, and lots of practice. It does not happen quickly. It comes after practicing regularly over a period of time. When you are learning drums, you are making your body do things that are not easy and which require a lot of concentration. Don’t be discouraged. All good drummers had to go through the same difficult things. There is no trick to becoming a good drummer. The only way is to practice.